Over the past few months, I’ve been preparing to take a major step in my life and develop a full time business from writing, speaking, and product creation. To take what I have learned here on the blog and create a business platform. My current job is ending at the end of June, and I look forward to having the time to do some of the things I’ve always dreamed about. One of those dreams is becoming a professional speaker. I’ve been involved with Toastmasters International for over 15 years and in that time, I’ve had the pleasure of speaking to many different organizations and in different venues. 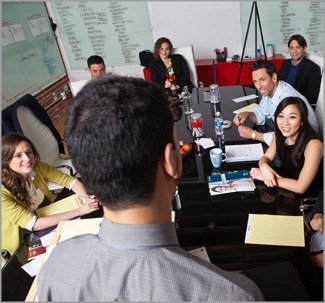 I’ve also met a lot of Professional Speakers after going through the Pro-Speak program with the Los Angeles Chapter of the National Speakers Association. Through it all I’ve come to realize how important it is to develop my own unique speaking platform. I need to put the program pieces together for meeting planners, business organizations, and speakers bureaus. With that in mind, I’ve spent the last month looking at my expertise and also my passions to develop a seminar that can be packaged as a whole or in separate pieces. I spent hours looking back over hundreds of blog posts and articles to see what has been popular and has generated the most conversation. I took a piece of paper and listed all the subject areas. I moved them around and crossed some off. I took the remainder and sorted. The end results surprised me. First there were 10, then 7, then 5. The words were all powerful concepts. As I finished up, I sorted the words and an acronym formed. The first letter of the five words formed a word with a multitude of meanings. These five words are clear and concise and are in proper order of execution. The are simple and easy to remember. 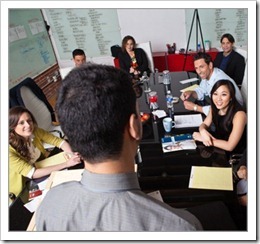 They will make up the content for a powerful personal growth seminar. When followed in order, they can radically change your life. This is truly what I want to write and speak about. Legacy: Picture yourself standing outside of your own funeral. What are people saying? What things have you left behind that will outlive you? Have you raised a family? Have you developed friends? Have you written a book, made a movie, or given a speech? What joy have you created for others to share? When you start with the end of your life, you can work backwards and see the milestones and goals that got you to where you were at. Planning your legacy before you die, will help ensure that your dreams and plans are fulfilled. Impact: Each one of us has the capacity to change the world. To make an impact. To change things for the better. The secret is to start with Impossible. To start with a goal so big that it seems impossible to accomplish. A goal so big that you can’t do it all by yourself. A goal that impacts others. When you have a goal this big, life becomes an adventure. It becomes fun and exciting to get up in the morning. Goals: While it’s important to have a large impact goal, the secret to getting through your week, is to have smaller weekly and daily goals. When you take a few minutes at the beginning of the week to plan out your activities and list your goals, you are much more likely to accomplish them. Once you have the week planned out, if you take a few minutes at the beginning of each day and fill in a daily planner, you’ll be on track for great productivity. Habits: Researchers have found that over 40% of our daily activities are done from engrained habits. If these habits do not match our goals, we are doomed to fail. Modifying your existing habits and creating new ones will ensure that you accomplish your priorities. The secret is to find what existing triggers and rewards are driving your activities and use a unique technique to modify them. Time: Once you know what you want, and have your goals and habits lined up, you need to schedule the time to accomplish them. Using our focused time techniques, you are able to blast through your daily activities with a minimum of distractions and watch your productivity soar. This seminar will have a workbook and individual planning sheets to get you up to speed quickly. Starting with where you want to go and working backwards, you are able to set goals and milestones to help you get there. Then we take a look at your existing habits and give you some helpful techniques to help you modify them to match your plans and a schedule to accomplish them.. This seminar will be available in a half day version and a weekend workshop. If you have a couple of minutes could you answer the following questions in the comments? 1. What do you think of the acronym LIGHT? 2. What would be a good name for the seminar? 3. What changes or additions would you suggest? Thank you for your help. Stay tuned this week as we look at some of the secrets to create and change habits. I have written extensively over the years about the Power of 48 minutes. Simply this is a way to divide an hour up 80/20. The way the program works is to block out all distractions and do one task for 48 minutes and then take a 12 minute break. Repeat as necessary. The beauty of it is its simplicity. 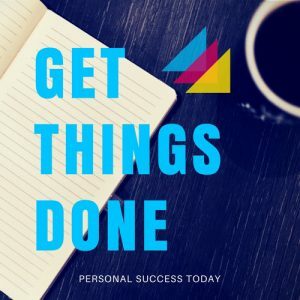 Using this single-tasking idea has helped me accomplish many large projects over the years such as writing a book, training for a triathlon, and getting my workday under control. The key to making it work is preparation. I need to clear my area of distractions by turning off e-mail, my phone, and any browsers I may have open. I then set a timer for 48 minutes and begin. The really cool thing about a 48 minute period is that it can be divided in many different ways. You can do two projects in that time at 24 minutes each, three projects at 16 minutes, four projects at 12 minutes and eight projects at 6 minutes. To make this division easier to plan, I’ve come up with some simple planning sheets marked up by time. I have a basic planning sheet divided up in 6 minute intervals which allows a lot of flexibility. I’ve also provided color coded sheets for two, three, and four projects each. Each sheet has the time elapsed on the right side and a check-off box for completion. 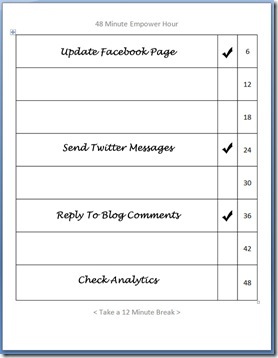 I find that I can get a lot of smaller things accomplished by using these sheets to plan ahead. The real problem with single-tasking strategies is the break time. If you re-introduce distractions, you often will not be able to continue. 48 minutes works well since it is based around the common hour and gives you time to stretch, use the restroom, and fill up your coffee. If you don’t have an hour, you can use the sheets for shorter periods of time. If you are familiar with other single-tasking strategies such as Pomodoro, you might find these sheets helpful in dividing your time up in strategic ways. 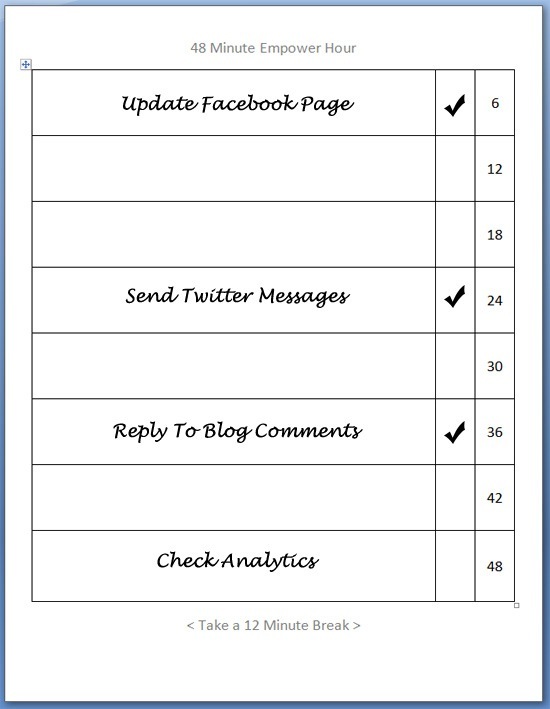 Here is a custom sheet I did for a web project this week. Using the basic sheet, I divided my 48 minute time period into 4 different projects. Using the sheet allowed me to allocate individual time periods, without using too much time on any one item. This really works well when you have an hour and you have to get multiple things done. Using a timer on the desk or computer will keep you moving along. Get to the end of your time period, you need to move to the next item. Really helps with procrastination or open ended projects. The four different planning sheets are available in MS Word format and also PDF in a single zip file. Download and enjoy the freedom of a well planned hour. Question: Have you tried single-tasking before?